Milton and I attended the sold-out screening of the HBO documentary George Harrison: Living in the Material World at the New York Film Festival. This 208 minute film directed by Martin Scorsese with the cooperation of Harrison’s widow, Olivia, will be shown in two parts on HBO starting tonight. We had fantastic seats, seventh row, almost dead center. The filmmaker, Wes Anderson, was sitting behind us. We saw Fisher Stevens and we also thought we saw the composer Philip Glass. I pointed out a guy that I thought could have participated in a John Lithgow look-alike contest. Milton: He could have entered but he would have lost. I can’t believe we have VIP seats! Me: Someone probably got fired for making that mistake. As I was leafing through my program, chatting with Milton, I reached our film’s description page. The woman sitting next to me, a Bjork-wannabe in the appearance department, floats her finger over George’s face in the photograph and mumbles his name into my left ear. This unsolicited gesture captures my attention. I don’t want to encourage her but I don’t want to appear rude. Me: Yes, that’s George Harrison. Milton mumbles her name into my right ear. Olivia Harrison and Martin Scorsese introduce the film. Then, the lights dim, the screen fills with tulips, and George’s middle-aged face appears in the garden. He looks at the camera and flashes an ethereal smile. I instantly feel a lump in my throat, but it just as instantly dissolves because Weirdo unfolds the oversized program guide and starts perusing it using her cellphone as a light source. She is also leaning over my armrest. She is so close to me that I can sniff her fragrance, Eau de Gag. There I am sitting next to a stinky deranged space invader that I’d like to beat with a Rickenbacker guitar while watching what might be the definitive documentary about one of the most spiritual rock stars ever. Instinct tells me that if I address her, this could get very ugly, very fast. I inch closer to Milton and stay focused on the film, but I do notice that when I react audibly to whatever is happening on the screen, it distracts her from her program guide reading and I can feel her staring at me. If I were to look at her, I know she’d be looking at me square in the face. I stay focused on the screen. Every so often her illuminated phone chimes. It also fully rang once. She quickly killed the ring, but the guy sitting next to Milton leaned forward and did address her. Guy Sitting Next to Milton: Shut that off! She followed his order. At that moment, I could have had that stranger’s child. The film conveys George’s frustration as being the lead guitarist to the Beatle’s two domineering writers, John Lennon and McCartney. In the beginning Harrison’s songwriting talent was undeveloped, but it blossomed over time (being in the company of Lennon and McCartney could not have hurt) but he had a tough time getting his less commercial songs on Beatle albums. He smashed one hit out of the park with Something. In the second half of the film, an interviewee suggests that although this classic Harrison composition is about a woman, it could just as easily have been about his close relationship with God. 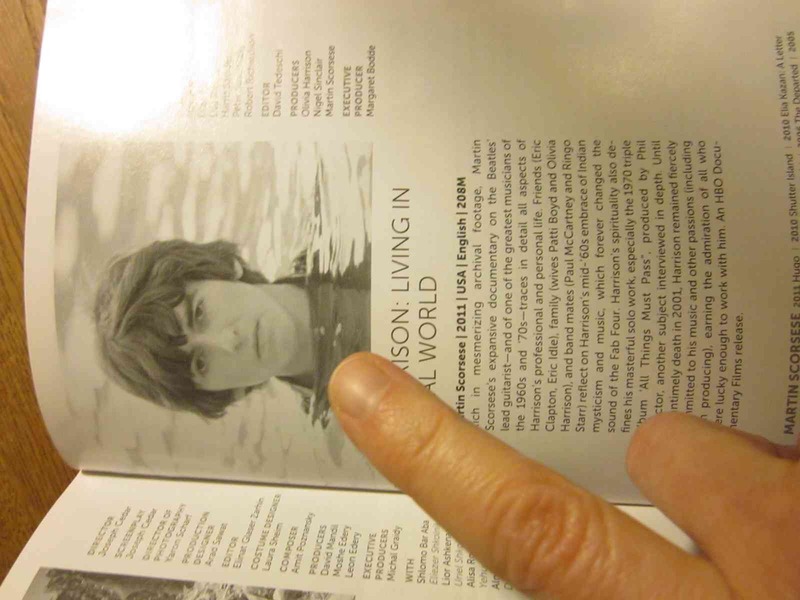 Part two of the film, the post-Beatle half, devotes much more time to George’s original music as well as to his spirituality. This was the half where I caught myself nodding out on several occasions. Yet, whenever he or Ravi Shankar began strumming a sitar, I quickly regained consciousness. Olivia: You don’t get divorced. A glaring omission was not mentioning that George lost a major copyright infringement suit that lingered for years. A judge ruled against him when it was deemed that he subconsciously plagiarized the Chiffon’s He’s so Fine when he wrote My Sweet Lord. Milton and I are both deaf to the similarities. What we also found baffling was why the filmmakers were so coy about the specific cancer that led to George’s death in 2001. He was seen smoking cigarettes throughout the film and was diagnosed with throat cancer in 1997. The subject of his cancer from the initial diagnosis through where he traveled for treatment was downplayed. Yet, it is mentioned that his cancer was in remission when an intruder attacked him in his home on New Year’s Eve 1999. Dhani, George and Olivia’s only child, eludes that the stress of that brutal attack may have expedited his father’s death. I am sure that that attack did not help George recover, but I am also sure that smoking a few packs for 30 or 40 years may have also contributed significantly to his passing. Why not be straightforward about that? I don’t think this film was funded by Philip Morris. Milton: I feel like I was lied to but in a very clever way. Overall, this film is very entertaining, but there are gaps in the narrative. As for Weirdo, she left her seat at intermission and did not return. Maybe Krishna or possibly George himself interceded on my behalf. Forbidden panel discussion iPhone photo that nearly got Milton handed his head on a plate by a watchdog usher. 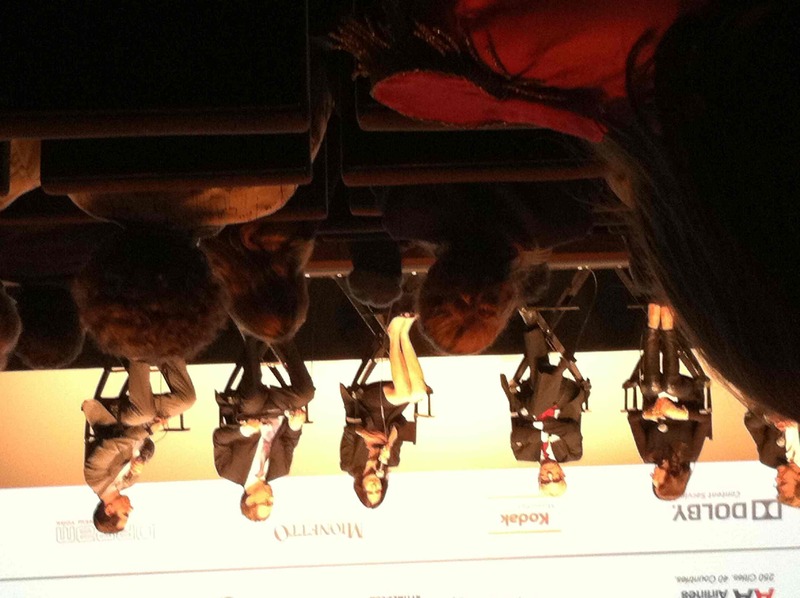 Left to right producer Nigel Sinclair, Olivia Harrison, Martin Scorsese, Margaret Bodde, David Tedeschi, and moderator Scott Foundas. Note woman in foreground wearing Sgt. Pepper-ette collection coat. This entry was posted in Humor and tagged documentary, george harrison, hbo, martin scorsese, new york film festival, olivia harrison, the beatles. Bookmark the permalink. i am really looking forward to this. I’m not the biggest Beatles fan, but I am a huge George fan. I’m sure this doc will be great! This film is George on steroids so I’ll go out on a limb and predict that you’ll be entertained. Jules. Seeing it over the course of two days instead of condensed into one is also less of an endurance test and probably far more sane. Incredible post! I wish we subscribed to HBO. Relieved to know you survived Weirdo. I just hope when I come home I don’t turn back my shower curtain and find her waiting for me with a butcher knife, Kathy. During the halcyon days of the economy I used to subscribe to HBO., but now I’m Boardwalk Empire deprived. Boo hoo. The Wayouts: From the Flintstones to Oblivion! Catch the true story of this way out rock group and what happened to them since their magnificent debut appearance on The Flintstones! Hey Max, if you read this post, I think I found the woman that’s just right for you. Her name starts with the letter ‘w’ but it’s not short for Wilma. George Harrison was my fav Beatle for a few years. I think I need to see this movie. If George is your favorite Beatle, this film delivers a whole lotta George (I don’t know what compelled me to get Led Zeppelin here)!